The National Bloggers Club, a new non-profit providing a loose association for free market bloggers, has officially announced a grant program for young citizen journalists in honor of Andrew Breitbart’s legacy, the Breitbart Scholarship Fund. 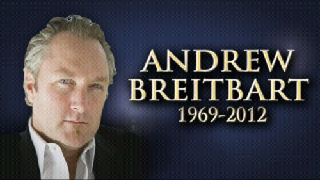 The fund has been set up in conjunction with a website, RememberBreitbart.com, dedicated to showcasing Andrew’s fans and showcase his work. Visitors of the website will be able to donate to the fund, apply for grants and submit their own videos to a library of fans memorializing Breitbart. “Not in a million years did I ever imagine that we would lose Andrew just weeks after I handed him the only award — from what I’m told — that he would receive recognizing his work. I knew we wanted to do something special to honor this man and make him a legacy, so when I was approached about having the National Bloggers Club ‘do something’ in Andrew’s memory, we jumped.” said National Bloggers Club President Ali A. Akbar.